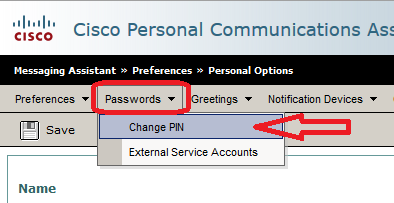 Navigate to the Cisco Personal Communications Assistant by going to https://campus.uwplatt.edu/go/uc, then clicking the blue "Manage Your Voicemail" button. Please Note: Internet Explorer will not render the menus in step 4. Please use Firefox, Chrome, or Safari. Log in to the Cisco Personal Communications Assistant by entering your campus username and password. Click on the "Messaging Assistant" link. Click on "Passwords" and then "Change PIN"
Enter a new PIN in both the New PIN field and the Confirm New PIN field and click the "Save" button. Your PIN has now been set. 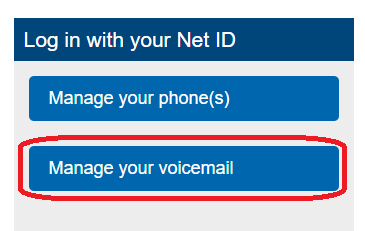 You will now be able to log in to your voicemail with this new PIN.